CloudKarafka is an add-on that provides Apache Kafka as a service. Apache Kafka is a message bus optimized for high-ingress data streams and replay written in Scala and Java. CLOUDKARAFKA_TOPIC_PREFIX A unique prefix that distinguishes topics on shared instances. After you provision CloudKarafka, your application should be configured to fully integrate with the add-on. CloudKarafka provides managed Apache Kafka servers in the cloud. Kafka is a distributed publish-subscribe messaging system that is designed to be fast, scalable, and durable. It’s an open-source message broker written in Scala that can support a large number of consumers and retain large amounts of data with very little overhead. CloudKarafka automates every part of setup, running, and scaling of Apache Kafka. We have support staff available 24/7 to help in any event or with any questions. CloudKarafka lets developers focus on the core part of their applications, instead of managing and maintaining servers. We offer five different plans for different needs. 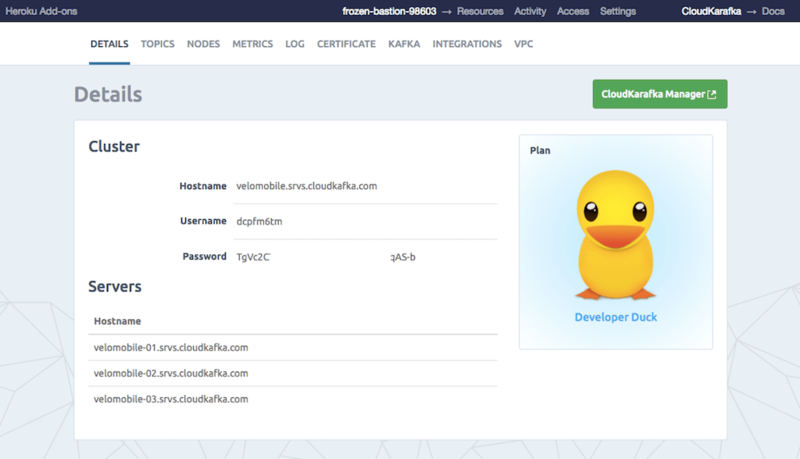 You can try CloudKarafka for free with the Developer Duck plan. All plans are billed by the second, meaning you can try out even the largest instance types without spending much. As soon as you delete your instance, you won’t be charged for it anymore. Billing occurs at the end of each month, and you are only charged for the time an instance was active. The dashboard contains useful information about your instance, along with configuration options for Kafka topics, and more. The following sections describe features of the CloudKarafka dashboard. When you create your instance, a default Kafka topic is created for you. You can add up to 5 topics to your free instance. Add new topics to your instance from the Topics tab of your CloudKarafka dashboard. The Apache Kafka log stream is available only for dedicated instances. This dashboard tab shows the live log from Kafka. Server metrics are available only for dedicated instances. The Metrics tab helps you to measure performance metrics from your server. CloudKarafka shows monitoring for CPU Usage, Memory Usage, and Disk Usage. CloudKarafka has a tool for management of Apache Kafka. It is enabled for new instances by default. For ruby the recommended library is rdkafka. Itis a wrapper around the excellent librdkafka and supports all the features in the latest Kafka release. The main feature that we need from a library is support for authentication with SASL/SCRAM since this is what CloudKarafka uses. Add rdkafka as a dependency to your Gemfile and execute bundle install. First thing that you have to do is connect to the Kafka server. You can get all the connection variables you need from Heroku to create the CloudKarafka instance. There are two very good libraries for Go, one is Sarama which is a pure Go library. Then we have confluent-kafka-go which is a wrapper around the excellent librdkafka. For this example we are going to use confluent_kafka_go since it support authentication with SASL SCRAM which is what we use at CloudKarafka. topic := os.Getenv("CLOUDKARAFKA_TOPIC_PREFIX") + ".test"
topic := os.Getenv("CLOUDKARAFKA_TOPIC_PREFIX") + "test"
Information about GDPR can be found here: https://www.cloudkarafka.com/gdpr.html. You can view the DPA here: https://www.cloudkarafka.com/dpa.html, and you need to send us an email if you need a signed version. All CloudKarafka support and runtime issues should be logged with Heroku Support at support.heroku.com. Any non-support related issues or product feedback is welcome at support@cloudkarafka.com. For our plans Bouncing Bat and larger, we provide 24/7 critical support with a 30-minutes maximum initial response time. For the plans Fast Fox and larger we also provide direct phone numbers.